Just Conservation - India’s militant rhino protectors are challenging traditional views of how conservation works. India’s militant rhino protectors are challenging traditional views of how conservation works. 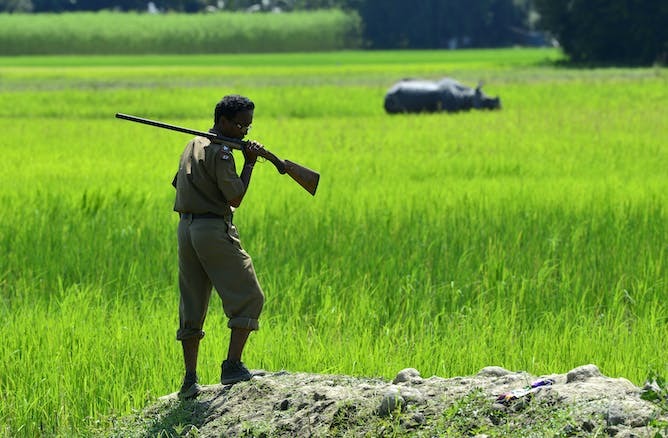 In Kaziranga, a national park in north-eastern India, rangers shoot people to protect rhinos. The park’s aggressive policing is, of course, controversial, but the results are clear: despite rising demand for illegal rhino horn, and plummeting numbers throughout Africa and South-East Asia, rhinos in Kaziranga are flourishing. 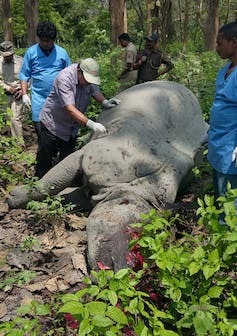 Yet Kaziranga, which features in a new BBC investigation, highlights some of the conflicts that characterise contemporary conservation, as the need to protect endangered species comes into contact with the lives and rights of people who live in and around the increasingly threatened national parks. India must balance modernisation and development with protections for the rights of local people – all while ensuring its development is ecologically sustainable. The BBC feature shows park rangers who have been given the license to “shoot-on-sight”, a power they have used with deadly effect. In 2015 more than 20 poachers were killed – more than the numbers of rhino poached that year. The programme accuses the rangers of extra-judicial killings of suspected rhino poachers. This resonates with a wider trend in the use of violence in defence of the world’s protected areas and the growing use of military surveillance technologies to support the efforts of conservation agencies. 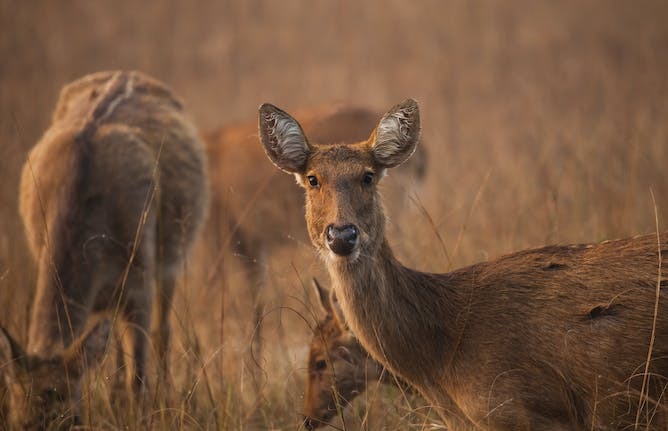 In India, the Forest Department, which is responsible for the protection of wildlife sanctuaries and national parks, has always been a “uniformed” service. Rangers wear military-style khakis, are allowed to carry arms, and have powers to prosecute offenders. Recently, the government allowed them to use drones as an anti-poaching measure in Kaziranga. To justify such escalation and its talk of a “war” against poaching, the government cites the growing power and sophistication of the crime syndicates involved in the illegal wildlife trade. However, as with all wars, a serious conflict over rhinos risks collateral damage. The worry is that increased militarisation is not conducted within strict legal limits or subject to judicial scrutiny. The BBC alleges that such checks and balances were not in place in Kaziranga. The BBC story also points to the growing conflict in and around Kaziranga between the interests and rights of local and indigenous people and the need to protect threatened species. Groups including Survival International – which features in the BBC story – claim that well-meaning conservation projects have denied and undermined the rights of indigenous groups around the world. The group calls for these rights to be placed at the heart of modern approaches to conservation – and most enlightened environmentalists now agree. It’s increasingly hard to look at conservation without also considering human rights and social issues. The context for these struggles in India is the colonial legacy of forest settlement, which reserved forests for the imperial state, but failed to take account of the rights of people who already lived there. This injustice was recognised in 2006, in landmark legislation known colloquially as the Forest Rights Act, which restored both individual and community rights based on evidence of historic access and use. Yet there remains significant tension between India’s wildlife conservation lobby, which perceives the Forest Rights Act as the death-knell for nature, and groups such as Survival International which argue that it is only by recognising the rights of local people that the country’s wildlife will be protected. 3. Can we keep expanding protected areas? To protect threatened species across the world, conservationists have called for more and more land to be placed under protection. Renowned biologist EO Wilson, for instance, wants us to set aside “half the planet”. In an unconstrained world, dedicating half the earth to the protection of the most threatened species and the world’s important habitats might seem like a sensible way to avoid the risks of what people fear might trigger the next great extinction. In reality, there are few places left where such a proposal might practically be implemented. Perhaps nowhere is this more evident than in rapidly developing India. The country already has a population of 1.3 billion – and it aspires to both develop as a global economic powerhouse and lift its poorest people out of poverty. This development requires land and resources, with little space left for nature. Plans to double the size of Kaziranga means villagers are being displaced with little due process and there are documented cases of violence and even death. This is a violent “green grab”, where land is usurped for ostensibly progressive environmental objectives, but which results in the dispossession of some of the most vulnerable people on this planet. Kaziranga illustrates the dilemmas of contemporary conservation. If it is to be successful, environmentalism in India must be seen as part of the changing social and economic context, and not set itself up in opposition to these wider trends. Conservation needs to recognise the need to build bridges, sometimes with its fiercest critics. While Kaziranga is in many ways a remarkable conservation success, its costs are considerable. The forces driving the world to overuse its resources haven’t gone away, and finding sustainable futures for both people and the planet requires coalitions that work together – let’s begin with Kaziranga.